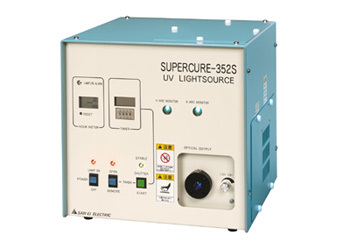 This is the ultra high power unit fully utilizing the high stability and long life 350watt ultra high pressure mercury lamp. The unit is made to compact size. SAN-EI's exclusive lamp arc monitor assures easy light axis alignment. Therefore lamp replacement time is extremely short. Abundant remote control functions for fully auto-matic operation are standard. *2 Accumulated running hours when lamp light output is decreased to 50% of initial value. *3 200V input voltage type must be specified with order.